My mother is a resident of Atria Burlingame. Her room is average-sized, clean, neat, and conveniently located to the dining room and all of the other activity areas there. She doesn't feel isolated, so that's really good. They have activities, like bingo, movies, outings, speakers and so on. They have a small library, a movie theater, an exercise room, and a beauty salon. I have a friend who lives in Atria Burlingame. She went there about four to five years ago, and she’s fairly happy. She has a small room that is adequate for her use and has its own bathroom, is well lighted which she likes, and it’s very near the nurse’s station. She’s usually out of the room all day until the evening. One time when I was there, they were doing some word games, and it was interesting. The activity therapist is quite entertaining and very engaging. I did stay a couple of times to eat with her, and the portions were fairly large for older people. They don’t have a lot of parking because it is in a small area so you do street parking. My friend doesn’t walk very far, so I’d go to the garage to pick her up, and sometimes it’s hard because there’s not a lot of space or handicap parking nearby. It’s in a nice area by the park, so it’s breezy and windy, even though it’s noisy because it’s by the train. The atmosphere is good. You can walk to the stores and to the park, where there are always children playing in the summer. The staff at Atria was helpful and knowledgeable. It’s older, but I would recommend it to others. The best way to get to know a community is by scheduling a tour. 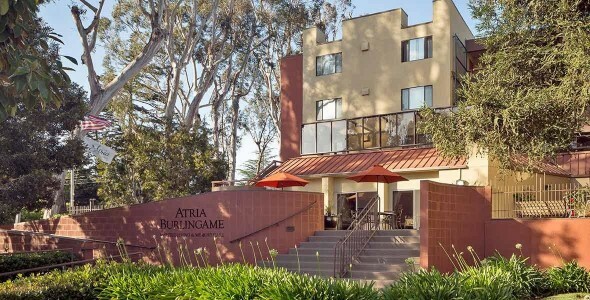 See the facilities, meet the staff and residents, and get a feel first hand what it's like to live at Atria Burlingame Assisted Living. The charming ambiance of Atria Burlingame makes everyone who steps foot in our community feel right at home. Residents, family and friends enjoy the inviting atmosphere of our active senior living community, which is set in a quiet, park-like neighborhood just outside San Francisco. Atria Senior Living offers more than simply a place to live, creating vibrant communities that give seniors companionship, comfort and safety. When people come to Atria Burlingame, they are taking the first step toward leading a richer and more fulfilling life. Each of our communities is a big family, and we invite individuals seeking senior living to consider joining us. There is never a shortage of things to do at Atria Burlingame. Thanks to our full-time Activity Director, residents can enjoy a wide variety of activities every day, such as chair volleyball, Pictionary games, happy hours, movie nights, guided exercise classes and even blackjack and bingo nights. Residents enjoy delicious chef prepared cuisine that is served daily in our restaurant-style dining room. Our Anytime Café also offers complimentary snacks and beverages throughout the day for a bite between meals. For the comfort and convenience of our residents, our staff take care of the housekeeping and home maintenance. We host an on-site beauty salon and barbershop so seniors can stay looking their best without ever having to leave home, but also provide private transportation services to residents who wish to attend appointments in town. Catering to seniors with a variety of needs, our community offers independent living, assisted living and memory care services. Our 24-hour caregivers are available to offer assistance with life's daily activities such as bathing, eating and handling medications. Residents facing the challenges of Alzheimer's and other types of dementia benefit from our secure, specialized memory care neighborhood and signature Life Guidance® memory care program. While choosing a senior living community can be a challenging decision, the wealth of amenities and services at Atria Burlingame makes the choice an easy one.